Looking for the best snake traps in 2019? Then you're in the right place! 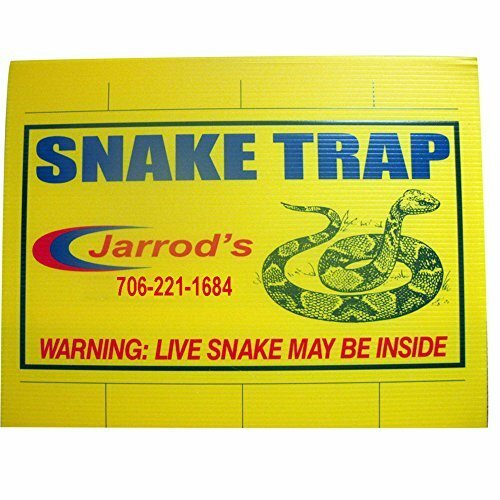 Out of the snake traps we reviewed, we really liked Jarrod's Humane Snake Trap. Out of the box comes one brightly colored pre-scented glue board perfect for outdoor use, quick identification., and snake capture. This is weather resistant and safe to use around pets or children. Just place it in the location where you see your snakes most (garden, etc). You should be able to locate a hole where snakes like to live. Place it nearby and wait a couple days for the snake to get trapped. Once trapped, you can let the little guy out by pouring a bit of vegetable oil on the glue. If you have bigger snakes or more extreme weather conditions around your home (intense heat/rain), then you should also consider the Cahaba Trap as well. It comes packaged with a cover to protect the glue board. Not necessary, but it definitely will lengthen the life of your product. Continue reading to find out how the other products did in our review and snake trap best practices. What Is a Snake Trap? How Do Snake Traps Work? What Makes a Good Snake Trap? Can a Trap Catch All Types of Snakes? Most people don't experience snake infestations, but those that do need a reliable solution. Enter snake traps, which are literally cages or glue sheets designed to capture cold-blooded reptiles. Not all traps are made equal, but some of the best can be used regularly to deal with slithering menaces. At their core, snake traps are any device designed to capture serpents. These can be a simple cage, a complex machine, or even just a sheet of paper with really sticky glue on it. What Makes Snake Traps Different from Other Type Traps? Snakes are almost entirely muscle. They can move by slithering and propelling themselves around, and this makes them extremely strong. A trap designed to hold a mouse, rat, or squirrel lacks the durability to contain an angry snake. This is one of the make reasons snakes have their own traps. Some serpents can also be 3-6 ft. long, so the trap needs to be big enough to fit the entire creature. Read Also: What're The Best Snake Gaiters? Snake traps do come in a variety of styles and therefore range in price. Solid metal traps are more expensive but also more reliable than a simple sheet of adhesive. The more expensive versions have covers to aid in weather resistance. Devices which cost more tend to be reusable and far sturdier than cheaper ones. What Types of Traps are Available for Snakes? Property owners can usually only buys cages or glue traps because these are the best way to capture snakes without using snake tongs. Snake tongs can be effective, but only if you have the strength to handle the reptile writhing at the end of the shaft. Cages can be reused, while most glue traps cannot. However, glue traps come in packs of multiple sheets. Most traps work by using a pre-scented glue board placed along side a wall near the snake's nest. Thankfully, snake traps are pretty easy to setup for most homeowners. Again, the key is to find where your snakes live, which is usually identified by a small snake hole in around a tree, garden bed, bushes, or some other area with space to hide and dirty to keep them safe. Here's a video we found that breaks down the setup and most of what you'd need to know to ensure snake victory. Because snake traps are simple, they can be judged using three criteria: strength, cost, and practicality. As mentioned earlier, snakes are almost entirely muscle. Even small variations like corn snakes can still bruise a human being, and large constrictors can completely suffocate regular people. Like a muscular person, serpents can through their weight around and will be able to damage weak or flimsy traps. To combat this problem, you will want to find a cage made of metal or glue traps that use a particularly sticky adhesive. Traps range in price from simple ones for $20 to more expense variations for $80+. The more expensive traps tend to be reusable with covers, while cheaper ones are usually single-use glue sheets. Depending on how large of a snake you need to capture, you might have to invest in a costly trap. If you just need to get a small garden snake, then cheaper will work for you. Unlike pest control methods designed for small nuisances like ants or mice, you really need to evaluate your personal skills when it comes to trapping a snake. They are much stronger and larger, and you want to find a device that you know you can use. For this reason, you need to know your snake and the pros and cons of the trap you want. Cages are easier for amateurs to handle because the serpent and its fangs will be away from your hands. A glue trap might catch a snake, but it can still bite. When shopping around definitely consider a trap with a cover to ensure the weather elements don't degrade to effectiveness of your trap. Most "cheaper" brands, are just glue open scented glue boards. With some rain and/or intense heat, the glue will break down. Most snake traps can capture small to medium serpents, which would be your average garden snake or perhaps a copperhead. Other serpents might be too big, especially if they are black rat snakes. Do NOT attempt to capture a venomous snake if you have no experience handling these reptiles. Use our tool and get a professional on the job. Most traps do not kill snakes and you will need to find a way to release them. Usually, you can take the trap to a wildlife preserve or a similar organization to have the snake released. However, if something goes wrong during the trapping, you don't want to risk your life. Stay away from venomous serpents. The brightly-colored Jarrod's Snake Trap allows users to easily locate it in long grass or wooded areas. The trap relies on a flat board with a strong adhesive. When snakes slither across it, they will become stuck. The adhesive used in the Jarrod's Trap is non-toxic. Snakes can be released in a separate location by covering them in vegetable oil or spraying cooking spray. The trap captures snakes up to 2 ft. long and is effective at catching garter snakes and Copperheads. Jarrod's make a more affordable trap able to catch multiple serpents. Baiting shouldn't be necessary. The board is larger than most other products at 18 in. X 10 in. The trap can catch snakes smaller than 2 ft. The Snake Guard Snake Trap is safe to use around pets and features a non-toxic adhesive. Users can release serpents or any other stuck animals using vegetable oil, which counteracts the glue. The trap is effective on serpents 2 ft. long and lower, and works well on baby or juvenile snakes. 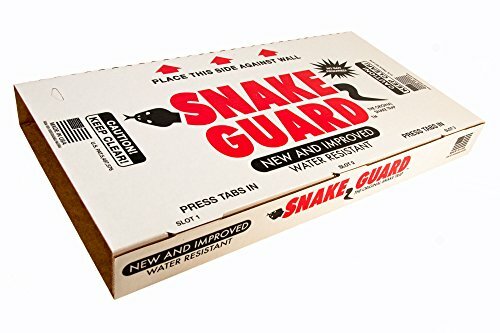 The Snake Guard comes with one to a package. There is a wax coating around the trap to make it water-resistant and protect the glue from the elements. The Cahaba is an environmentally friendly snake trap which features a board coated in strong adhesive. Snakes which slither across it will become stuck. They can be released in a separate location. Unlike other glue traps, the Cahaba Large Snake Trap is reusable. This product is water-resistant, a useful feature for individuals who need to deal with outdoor slithering fiends. The Cahaba has large dimensions and works best for snakes under 2 ft. long and juveniles. Adult snakes can be captured, but might break loose. It is large enough to catch big snakes with the following dimensions: 32 in. X 9.5 in. X 2.5 in. The Catchmaster Snake Glue Boards are the most flexible snake traps. They can be folded or resized to fit into every nook and cranny of a yard or basement. They operate like simple glue traps with a strong adhesive covering a plain board. One of the highlights of the Catchmasters is that they come in sets of 5 for the price of 1 of its competitor's traps. The glue is non-toxic and environmentally friendly, and the trap won't harm pets. 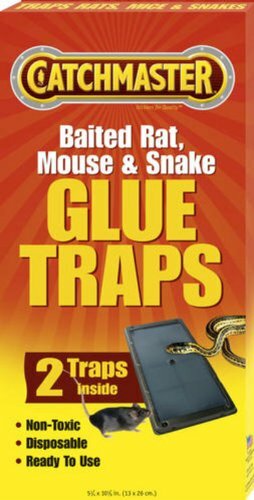 I recommend this trap to individuals who need to catch multiple snakes and would like to be able to capture additional pests like mice as well (although we don't recommend it). Any of these traps would work well for the average individual. Out of all of them, our personal favorite is the Jarrod's Humane Snake Trap. Captured serpents can be released in a safe location and the adhesive poses no risk to animals of any kind. The trap can also capture larger snakes, which is useful for people who are truly living a herpetology nightmare! 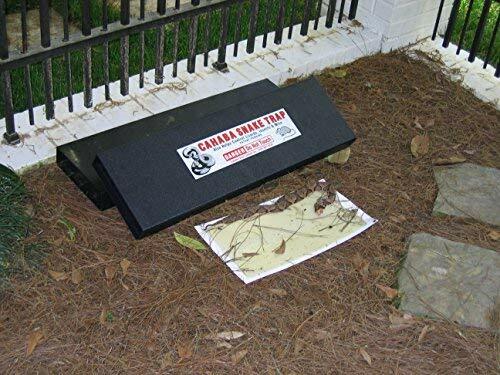 If you want something more reusable, we our #2 pick the Cahaba Snake trap has a cover and additional weather resistance perfect for most homeowners.